Congratulations to BPD Academy Class 58-18 for earning their blue guidon flag last week. The flag is a symbol of class unity, teamwork, bonding, and integrity. Keep up the hard work and don’t give up! For Kathleen McKiernan’s full story, click this LINK. We would like to welcome another class of Boston Police Cadets as they start their first day of training at the Boston Police Academy. 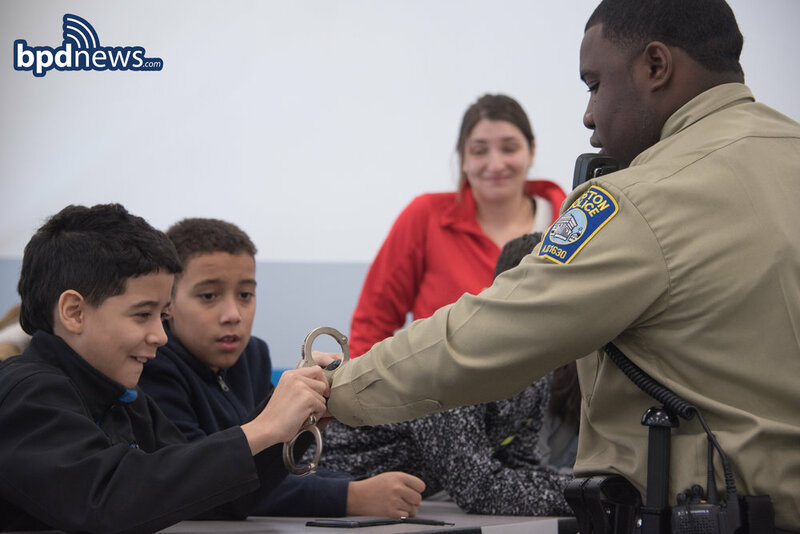 The Boston Police Cadet Program is an on-the-job training program for Boston's youth seeking a career in law enforcement. The program is a minimum of a two-year commitment. Cadets rotate throughout the Department in various assignments and shifts, including Headquarters, District Stations, and other specialized units throughout the City. To be eligible you must be between the ages of 18-24, be a current resident of Boston, and have maintained Boston residency for the last 5 years, be a United States citizen, have a valid Massachusetts driver’s license and take and pass the Boston Police Cadet Exam. 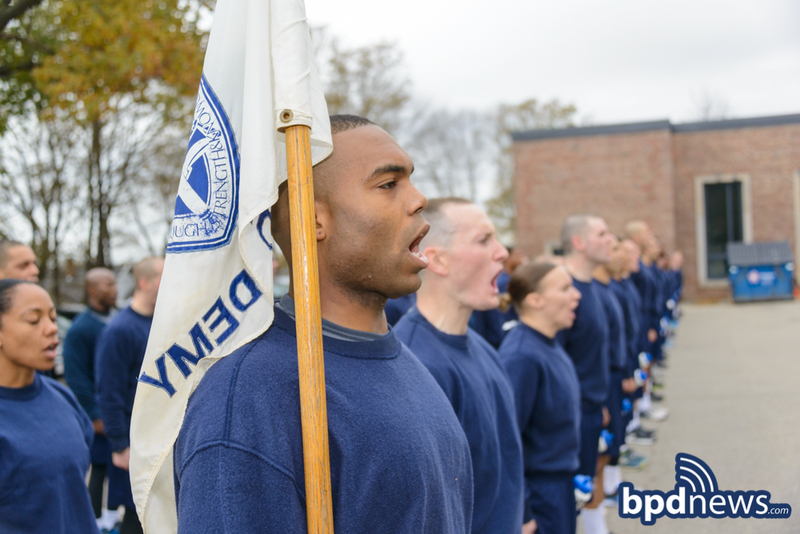 If selected for appointment, candidates must pass an extensive screening process including: drug testing, a pre-employment physical, an extensive criminal background check, and a rigorous 8-week cadet training program (both academic and physical in nature) at the Boston Police Academy. On Tuesday, April 17, 2018, Boston Police Superintendent Lisa Holmes was presented with the Alfreda Harris Award for Exceptional Community Service. 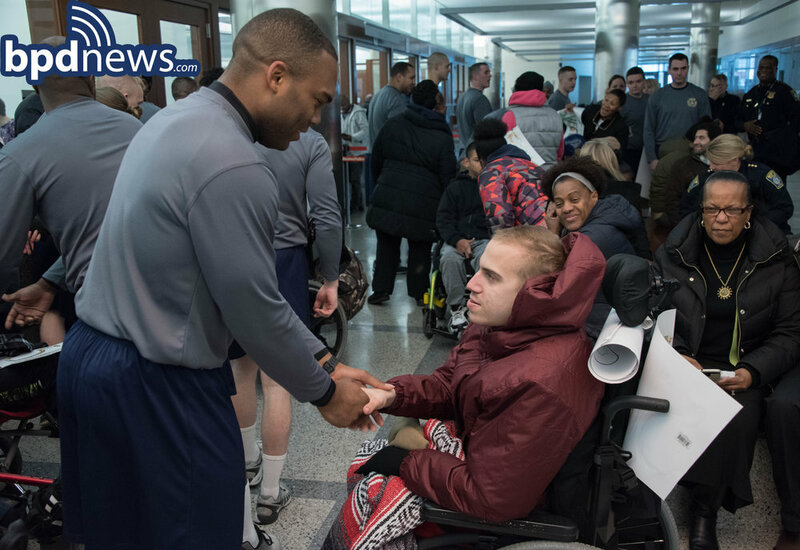 The ceremony took place at UMass Boston, Clark Athletic Center, during the Suffolk County District Attorney Daniel F. Conley's 10th Annual Basketball for Peace Tournament. 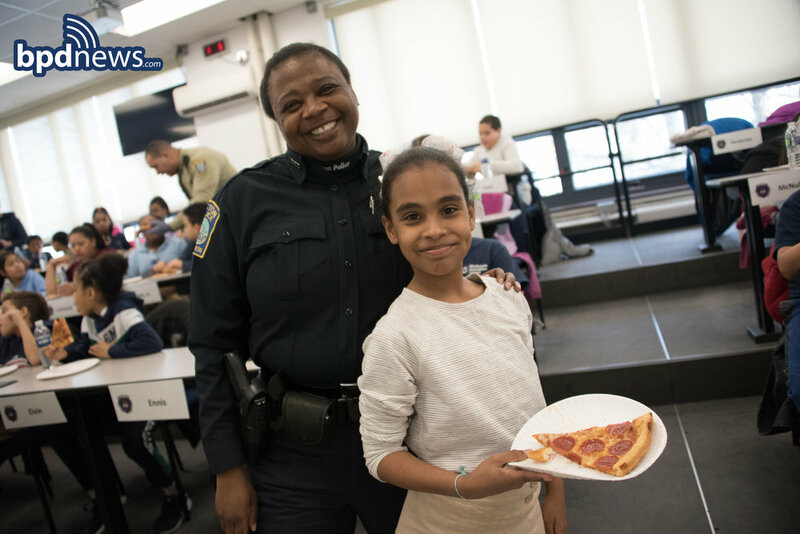 For more than 30 years, Superintendent Holmes has represented the very best of the Boston Police Department and she has helped to change the way Boston approaches police work. Superintendent Holmes was a street cop, walking the beat in Orchard Park, where she grew up and served as one of the first members of the Gang Unit in the ‘90s. She has worked as a detective on some of the toughest, most demanding cases in the Sexual Assault, Homicide, and Human Trafficking units. By training new and veteran officers at the Boston Police Academy, Superintendent Lisa Holmes is shaping the Department’s future. She has embraced every challenge and she has never lost touch with the community she serves. Superintendent Lisa Holmes is one of the finest that Boston has to offer. The Alfreda Harris Award is named for a living legend whose record of service is as rich as it is long. As a trailblazer in social justice causes, a hall-of-fame coach, an advocate for children and young adults, the longest serving member in the history of the Boston School Committee, and an unstoppable force for positive change in our community, the Alfreda Harris Award is one of the city of Boston’s highest honors. Congratulations to Boston’s Newest Class of Crime Fighters: Boston Police Academy Recruit Class 57-17!!! Today, Tuesday, April 10, 2018, Commissioner William Evans and Mayor Marty Walsh welcomed 97 new officers to one of the greatest police departments in the nation during a graduation ceremony held for BPD Recruit Class 57-17 on the campus of Boston University. To all of our new officers embarking on a career dedicated to protecting and serving one of the safest big cities in America, we wish you nothing but the best of safety and success for the duration of your careers. WHO: Mayor Martin J. Walsh; Police Commissioner William B. Evans; Superintendent-in-Chief William G. Gross and members of the Boston Police Department Command Staff; Boston Police Academy Staff; graduating police recruits; elected officials, local, state, and federal law enforcement partners; family and friends. 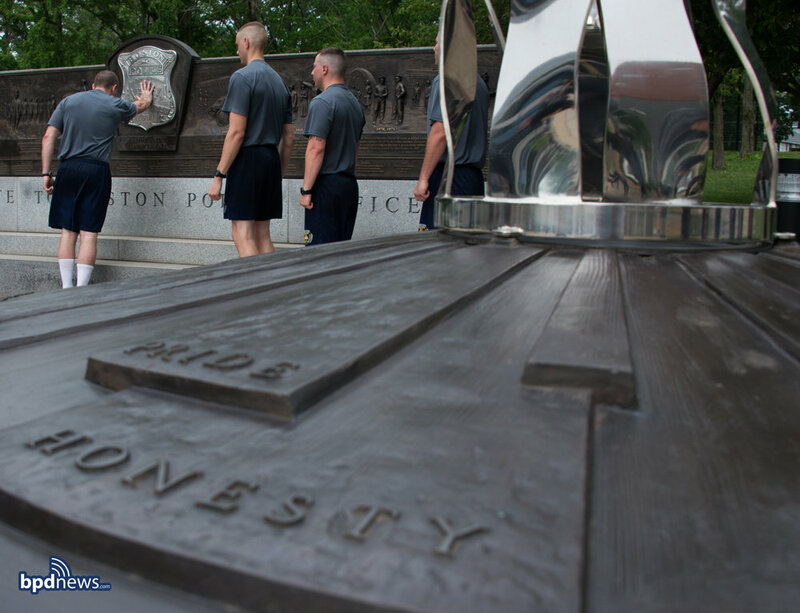 WHAT: Tomorrow, after six months of training, the Boston Police Academy will graduate ninety-seven recruits in Class 57-17. This is the largest graduating class from the BPD Academy in over ten years, with all ninety-seven recruits to be assigned to the Boston Police Department upon graduation. WHEN: Ceremony to take place on Tuesday, April 10, 2018 at 11:00 AM with media availability to follow. WHERE: Boston University Agganis Arena, 925 Commonwealth Avenue, Boston, MA. “We commend this year’s Police Academy graduates for reaching this milestone and for choosing a career serving and protecting the public. At Boston University we value and depend on our close working relationships with Mayor Walsh, Commissioner Evans, and the officers who every day make Boston the safe and welcoming place that it is. We thank you in advance for your efforts." Boston Police Academy Recruit Class 57-17 would like to thank the students of English School for their warm reception and support at the conclusion of the run. The students were accompanied by their teacher, a mother of a recruit! WHO: Boston Police Commissioner Evans, Boston Police Department Command Staff, Boston Police Academy Staff, Boston Police Academy Class 57-17 Recruits, members of the Boston Police Department, and invited friends, family, and guests. 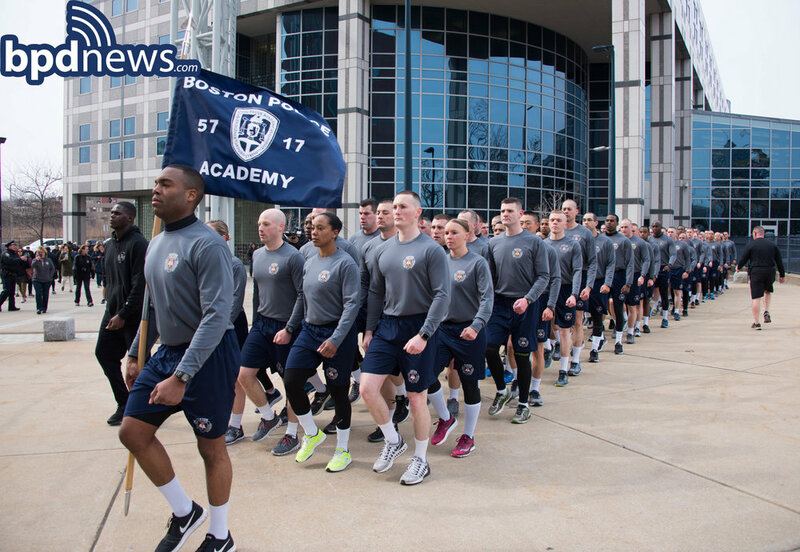 WHAT: In honor of their impending graduation next week, Boston Police Academy Recruit Class 57-17 will make the traditional "Run to Boston Police Headquarters" from Hyde Park, joined by Commissioner Evans, on Friday, April 6, 2018, arriving at Headquarters at about 9:30 AM. The recruits will enter the roundabout in front of Headquarters, conduct a short exercise session, and then proceed to the Boston Police Memorial for a brief ceremony. All are welcome to greet the Recruits and Academy Staff on arrival in front of Headquarters and at the Memorial. WHEN: Friday, April 6, 2018, at approximately 9:30 AM. WHERE: Boston Police Headquarters, One Schroeder Plaza, Roxbury, MA. CONTACT: Boston Police Media Relations (617) 343-4520 for media inquiries. 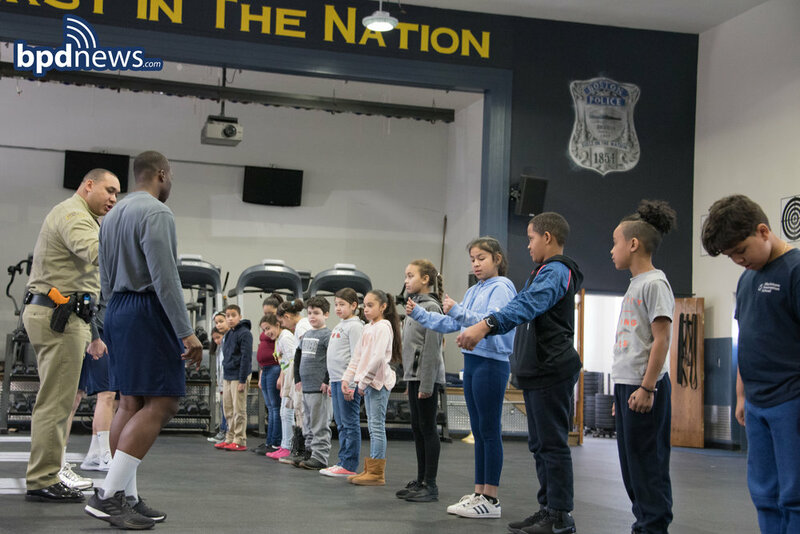 Last week, on Wednesday, March 21, 2018, students from the Blackstone School in District D-4 (South End) took a field trip out to the Boston Police Academy to meet the recruits, who are set to graduate and hit the streets in Boston communities on April 10. Thanks to the MBTA, who donated buses, the kids took a ride with BPD and Transit officers out to the Academy. Both the kids and recruits alike had an awesome time getting to know each other. Even though they started the day out all business with a meet-and-greet and Q&A about the recruits, the laws, and their duties, the fun and games broke out when the recruits led the students through some PT and had a contest for who could stand at attention the longest. Nothing like rounding out the day with a pizza party (with pizza provided by Kappy's Pizza!) and a word from the top cop, Police Commissioner Evans! A new batch of candidates for detective have just completed their final preparatory training at the Boston Police Academy in anticipation of forthcoming promotions. In addition to the eighteen Boston Police Department detectives, two Boston University detectives and two Harvard detectives culminated their training by processing a full "mock" crime scene, utilizing all of the skills they have learned over their four-week training course. Congratulations to BPD Academy Class 57-17 for earning their blue guidon flag on December 20, 2017, a symbol of class unity, teamwork, bonding, and integrity. Keep up the good work; you're almost to graduation! Chief Gross was especially proud of the attendance and effort put forth by the members of BPD Recruit Class 57-17 at last week’s DAV 5K for veterans at Castle Island in South Boston. The men and women of the BPD are and will forever be grateful and thankful to all who have served and continue to serve our great country. 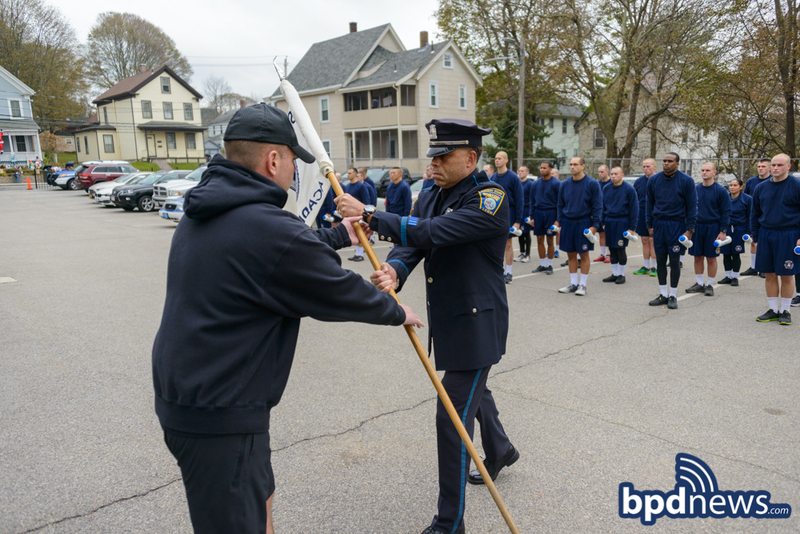 On Monday, November 13, 2017, the 100 members of Boston Police Academy Class 57-17 received their white Guidon class flag, signifying their first achievement as a unified group. The white Guidon flag is symbolic in that it now identifies Class 57-17 when they are on recruit runs or marching in formation, carried by the class Guide at the front of the formation for all to see. In a few weeks, Class 57-17 hopes to exchange their white flag for a blue one, signifying not only unity, but the cohesiveness, camaraderie, and responsibility that their class will carry with them throughout their careers. 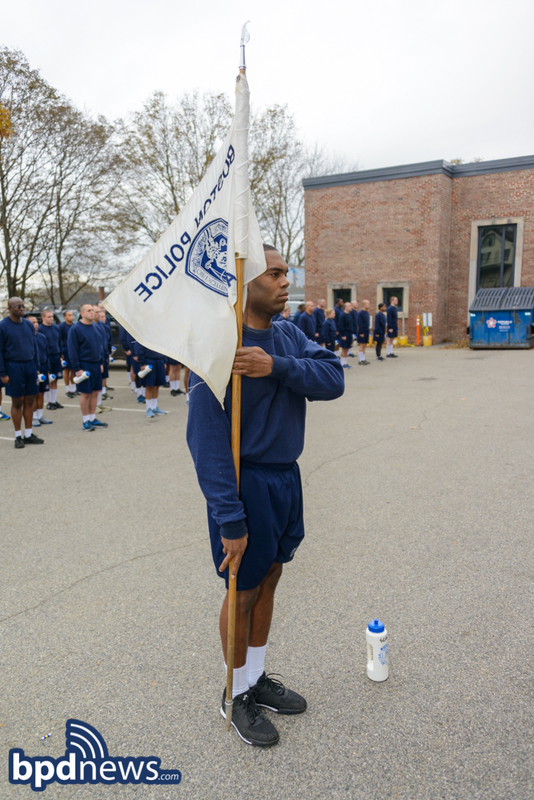 At graduation, their blue Guidon flag will take its place among previous recruit class flags proudly hanging in the halls of the Boston Police Academy. Congratulations, Class 57-17, on this noteworthy accomplishment on your way to becoming Boston police officers! WHAT: Thirty-eight high school students will be graduating from the Boston Police Teen Police Academy, a summer program created to strengthen and enhance the relationship between our city’s young people and the men and women sworn to protect them. This year, six middle school students will also be graduating from the introductory program. Since the TPA’s inception in 2010, there have been 328 teen participants in the program. And just as the real BPD recruit officers complete a Run to Headquarters prior to their graduation from the Academy, the graduating members of the Teen Police Academy will participate in a run from District B-2 (Roxbury) to Headquarters. WHEN: Run to Headquarters—Thursday, August 10, 2017 at 9:30 AM. Graduation Ceremony—Thursday, August 10, 2017 at 6:00 PM. Memorial at Headquarters, One Schroeder Plaza, Roxbury. 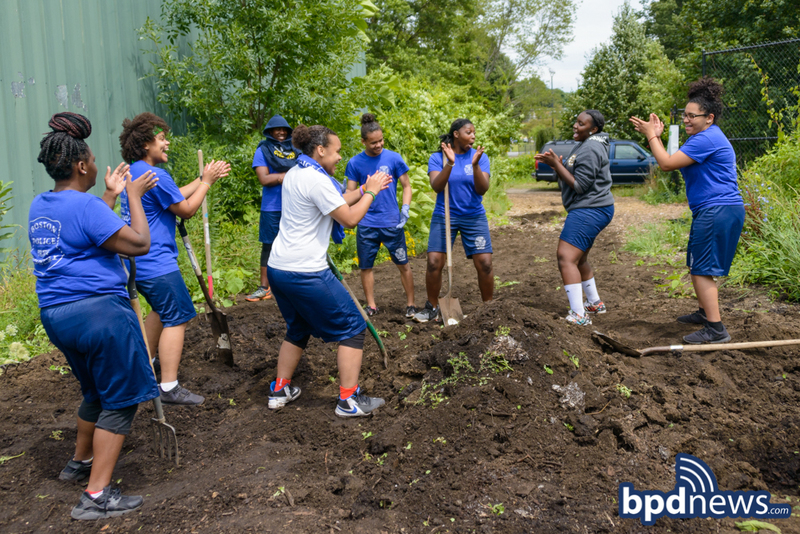 Last week, the BPD Teen Police Academy had the opportunity to do some gardening with the volunteers for the Urban Farming Institute at the garden behind the Sportsmen’s Tennis & Enrichment Center in Mattapan. The volunteers from UFI worked with the teens to show them the different aspects of urban farming, including teaching the kids about the many types of vegetables they grow. 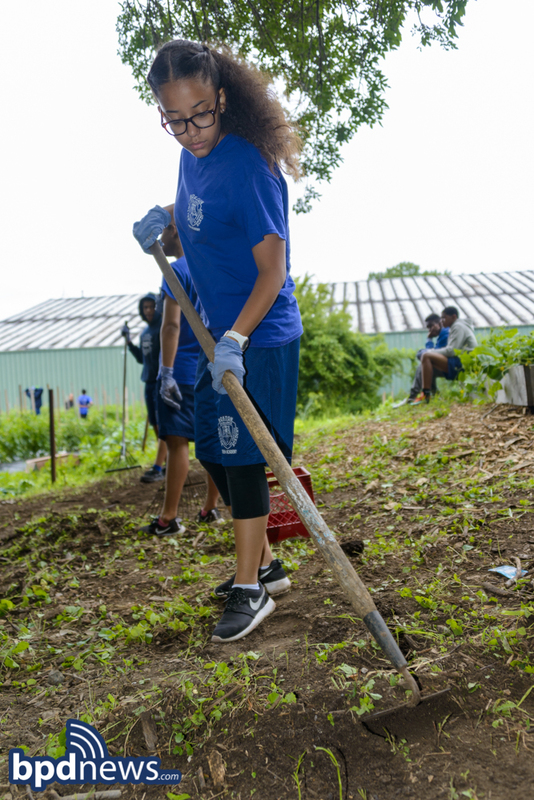 The teens dug right in and learned quickly that “many hands make light work,” delighting the UFI volunteers at how much gardening they accomplished in one day. Not only did the Academy kids learn the importance of volunteering to help in their community, but they made it fun by providing their own soundtrack, spontaneously breaking into song and dance during a little down time! The students will celebrate their graduation from the TPA tomorrow Thursday, August 10, 2017 with a run from District B-2 (Roxbury) to BPD Headquarters in the morning and a graduation ceremony in the evening at the Boston Police Academy. On Wednesday, June 21, 2017, seventy recruits from Boston Police Academy Class 56-16 took an oath to protect and serve, fifty-six of them for the City of Boston. As they stepped off the stage as fully sworn police officers, they will take with them the memory of a very special young boy, honorary Boston Police Officer Kolton Hessman. Young 3-year-old Kolton recently passed away from Congenital Heart Disease while waiting for a heart transplant, but only after BPD Academy Instructor Officer Kevin Welsh and the recruits of Academy Class 56-16 took a special interest in Kolton, sending him BPD patches and gifts to his home in Tennessee and raising money for Kolton's family. 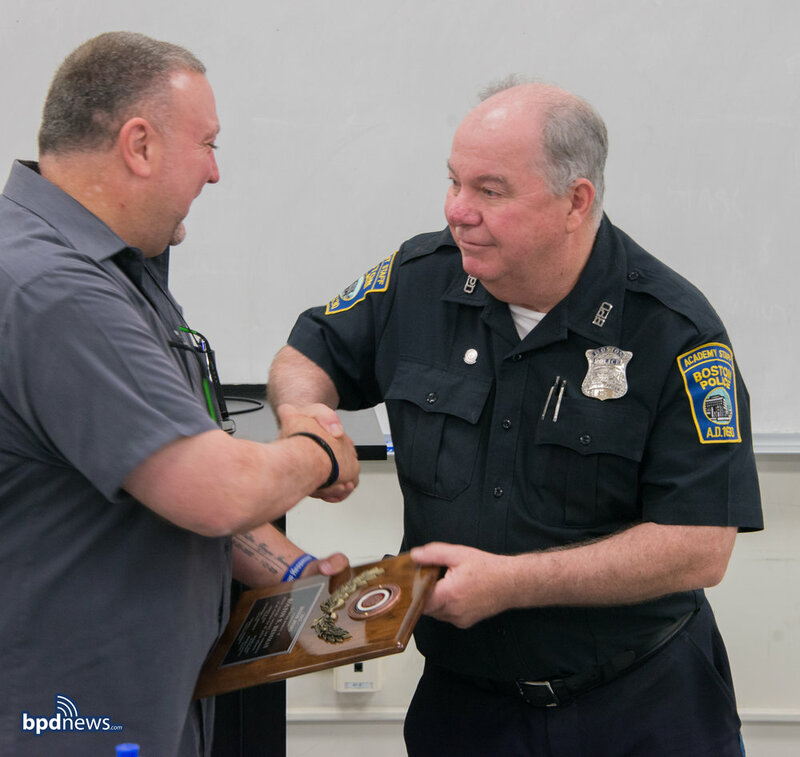 Last month, Kolton was posthumously sworn as an honorary Boston Police Officer in an emotional ceremony with Class 56-16, a ceremony indicative of an eternal bond between these recruits and little Kolton. As the recruits hit the streets tomorrow, Saturday, June 24, 2017, they will surely carry with them Officer Hessman’s memory. 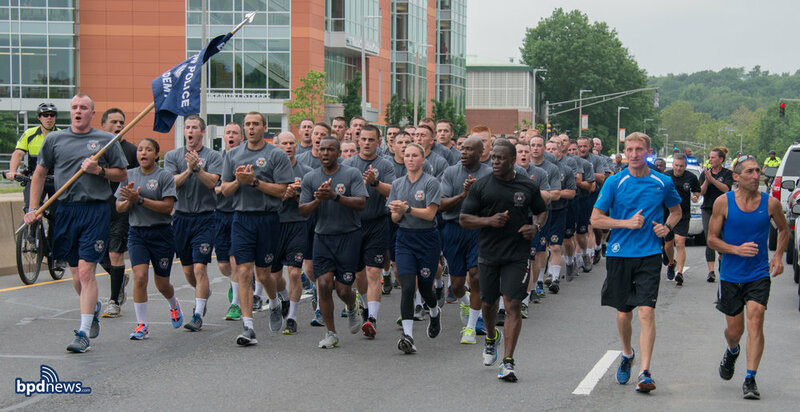 This morning, Monday, June 19, 2017, Boston Police Academy Class 56-16 completed their traditional run from the Academy to BPD Headquarters. 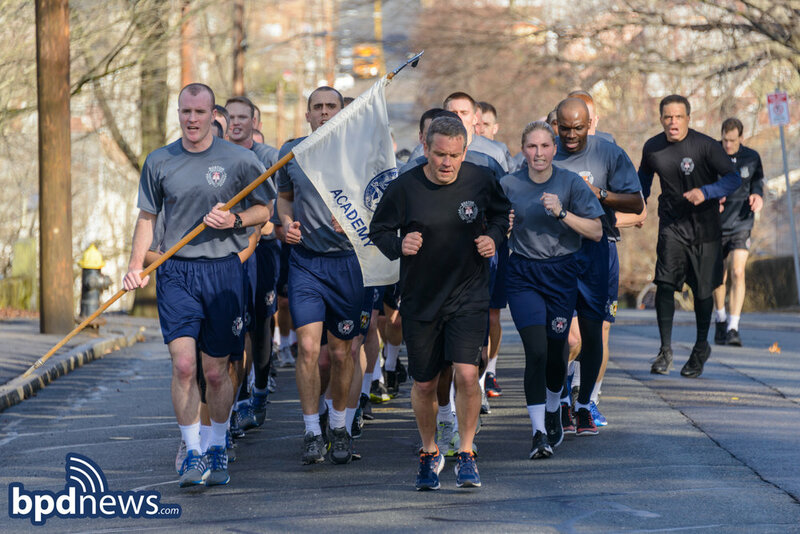 The run, which is completed by the recruits a few days before their graduation from the Academy, winds over approximately 8 miles through a number of Boston’s neighborhoods and is symbolic of the distance the recruits have come in six months of training and the transformations they have made from civilian to police officer. Upon arrival at headquarters, the recruits lay a wreath at the Boston Police Officer Memorial to remind them of those that have paved the way and come before them. Congratulations, Class 56-16, you’ve come a long way! Today, Kolton Hessman’s parents traveled from Tennessee to Boston to thank the men and women of the Boston Police Academy for the kindness and compassion shown during Kolton’s search for a heart transplant. BPD Academy Instructor Officer Kevin Welsh first came across 3-year-old Kolton’s fight against Congenital Heart Disease (CHD) while browsing Facebook in December 2016. 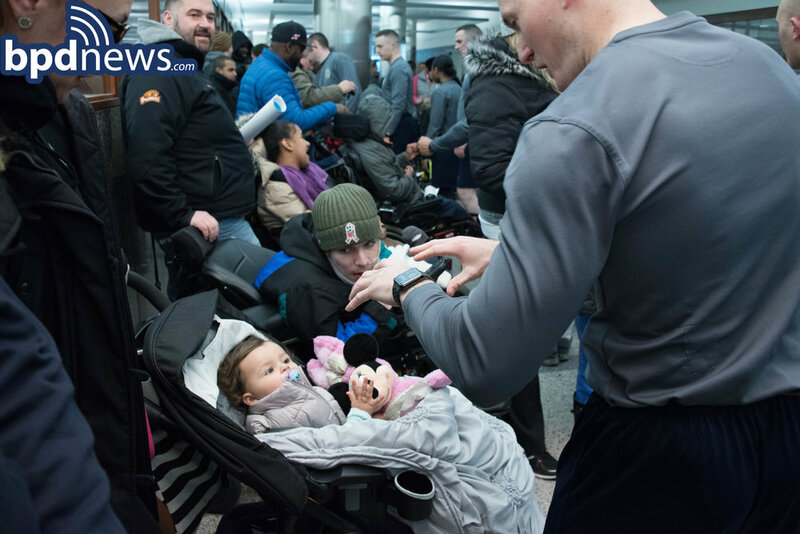 Officer Welsh instantly felt connected to little Kolton who was pictured in a miniature SWAT uniform, and he reached out to the family by sending BPD patches and a gift bag. Over the next few weeks, Officer Welsh and BPD Academy Class 56-16 formed a strong long-distance friendship with Kolton and his family, making it their mission to find him a compatible donor and bring awareness to this disease and the need for transplant donors. Sadly, Kolton lost his battle with CHD in January 2017 while waiting for an organ donor. But today, young Kolton’s strength and courage were celebrated and honored during a ceremony in which Kolton was posthumously made an official Boston Police Officer. 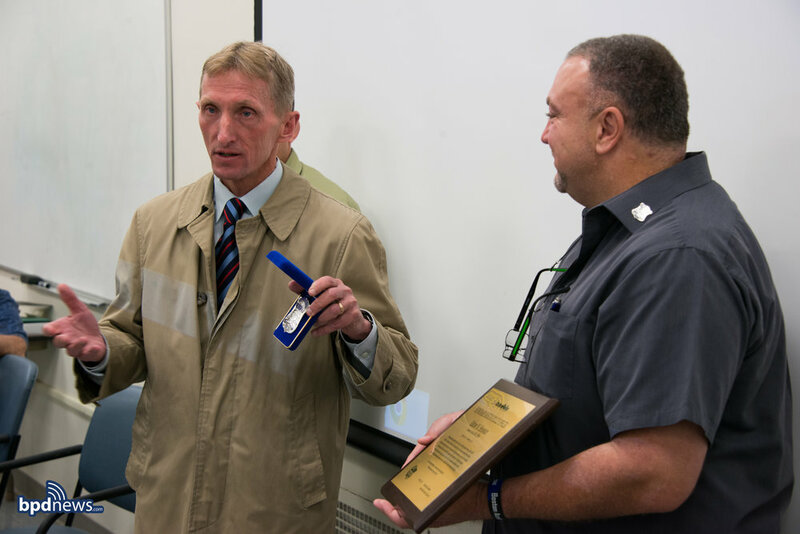 Officer Welsh and BPD Academy Class 56-16, along with Boston Police Commissioner William Evans presented plaques and Kolton’s badge to Kolton’s parents. The Academy Class even set up a memorial for Kolton in a display case in the front entrance of the Academy. Said Kolton’s father, Grant Hessman, “They’ve rallied behind us since day one and haven’t stopped. 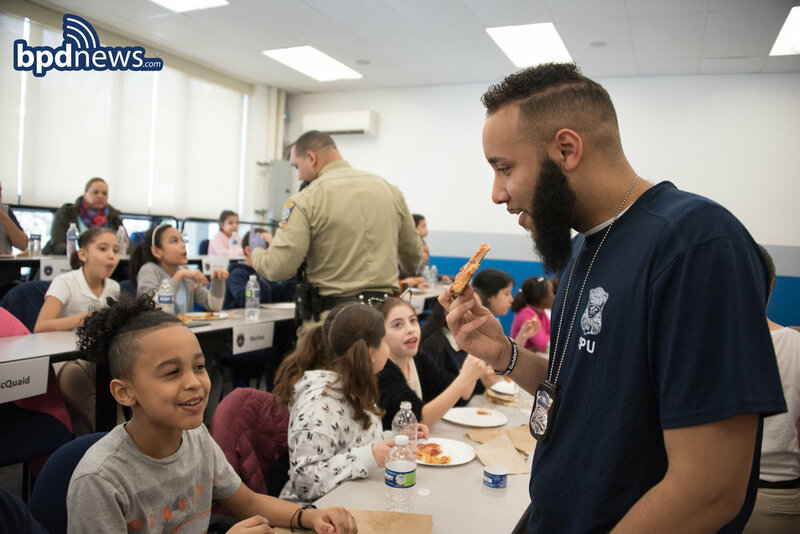 We live in Tennessee and to have this kind of support from this far away is phenomenal.” It just goes to show that when it comes to community policing, for the men and women of the BPD, our community knows no bounds. This month, BPD Academy Class 56-16 reached an important milestone in their training and education on their way to becoming police officers. On Friday, April 7, 2017, the Academy Staff replaced the recruits’ white Guidon flag with the blue one in a presentation on Fairmount Ave in Hyde Park. The blue Guidon has come to represent a breakthrough in the class’s training, symbolizing class unity and solidarity, and emblazoned with their class number. Congratulations, Class 56-16—you’re on your way!